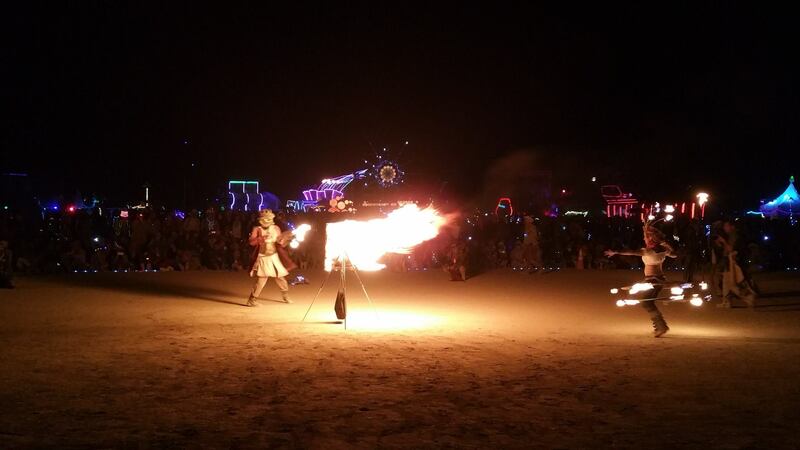 I had the honor of performing in the Burning Man Fire Conclave last year, along with the members of the Aish Tamid Fire Conclave from Philadelphia, PA. Here are some photos of our opening fire painting duet, featuring the renaissance fire painter Neptuno deFishi, as he attempts to paint the lovely lady Racetrack. 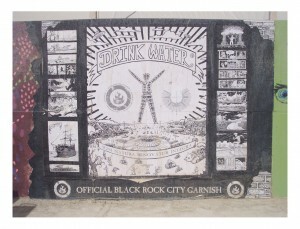 The ‘canvas’ was stretched kevlar fabric over a wooden frame soaked in lamp oil and white gas. The palette and paintbrush were also constructed with kevlar wicks. 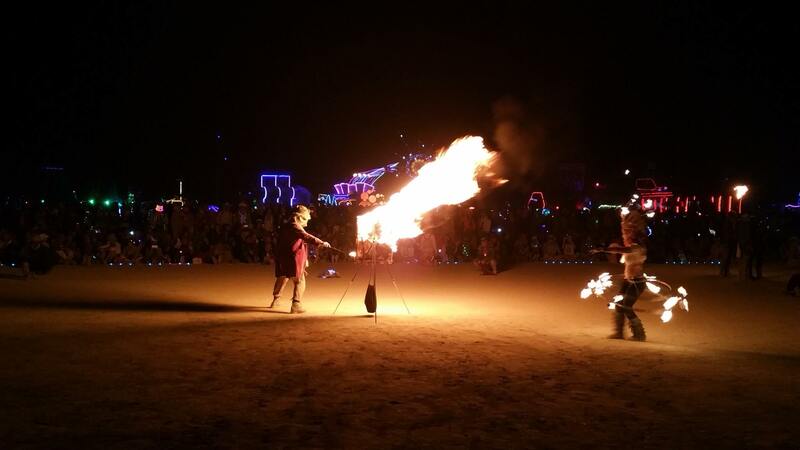 Thanks to Kevin LeVezu & Jay Shok for the photos, and to the Aish Tamid Fire Conclave for the opportunity to participate in such a spectacular show. 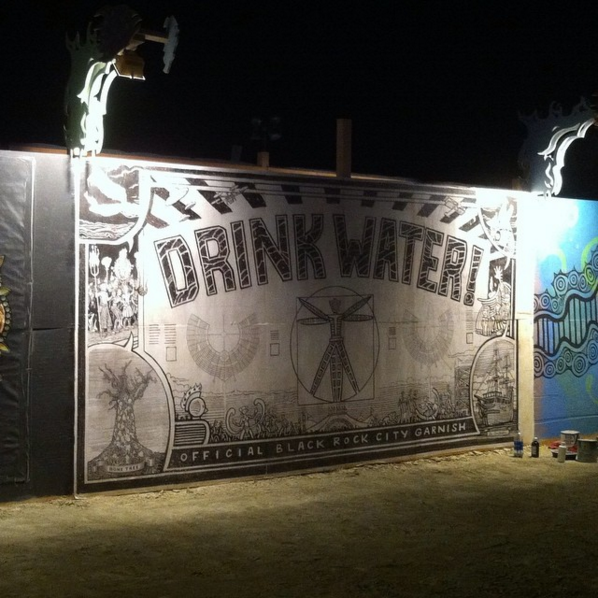 Stay tuned for more updates, as I’m sure this scene will find its place in the ongoing saga of Drink Water! 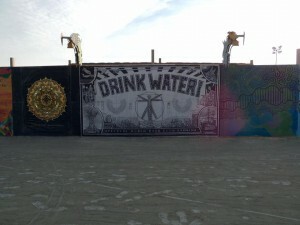 Happy to announce that BurningMan.org has started a syndicated run of Drink Water!, starting from the very first episode. New episodes will post weekly on their website and will continue through the end of 2017. This syndicated run will feature longer episodes, a little extra polish, and a few slight revisions along the way. Ahoy Reader! Happy New Year! 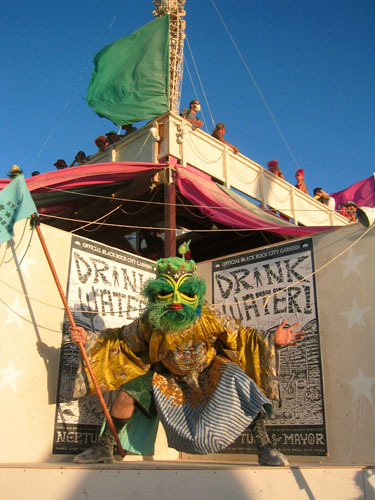 Thanks for following Drink Water! We are just a few weeks away from the end of Book 1. Does that mean our story is done? Hell, no! 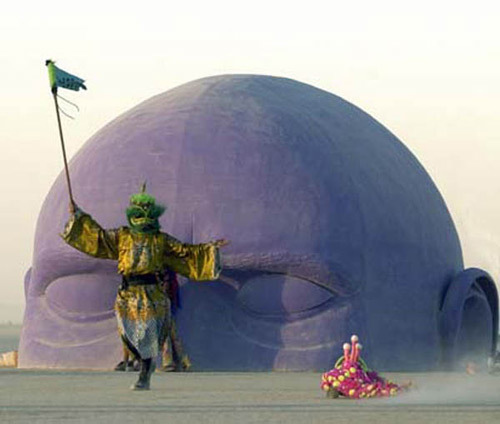 But it does mean that we’re reaching the end of our first day in Black Rock City. Once we reach the end of Book 1, we will pause briefly while I spend a few weeks editing and making some slight changes to the script so far. Some pages will come out, other pages will be added in. Look for changes coming to episodes 29, 48, 52, 92, 108, & 126 to name a few. Also, I’m planning to add some additional pages around episodes 17 & 74. I’ll post updates with the edits as they happen. 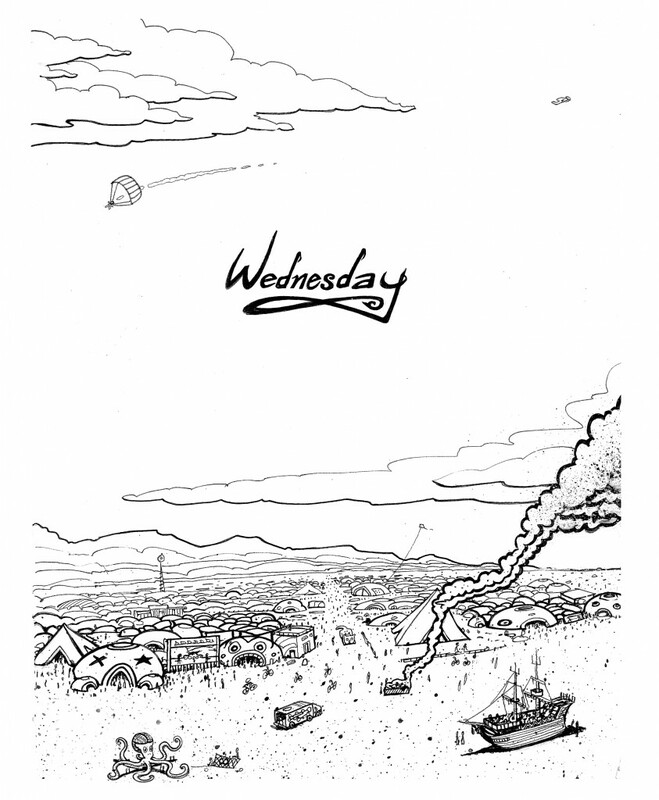 Once Book 1 is done and ready to print, we’ll move right into Book 2 which picks up our story on Wednesday morning. And Book 2 is a doozy! Dragons! 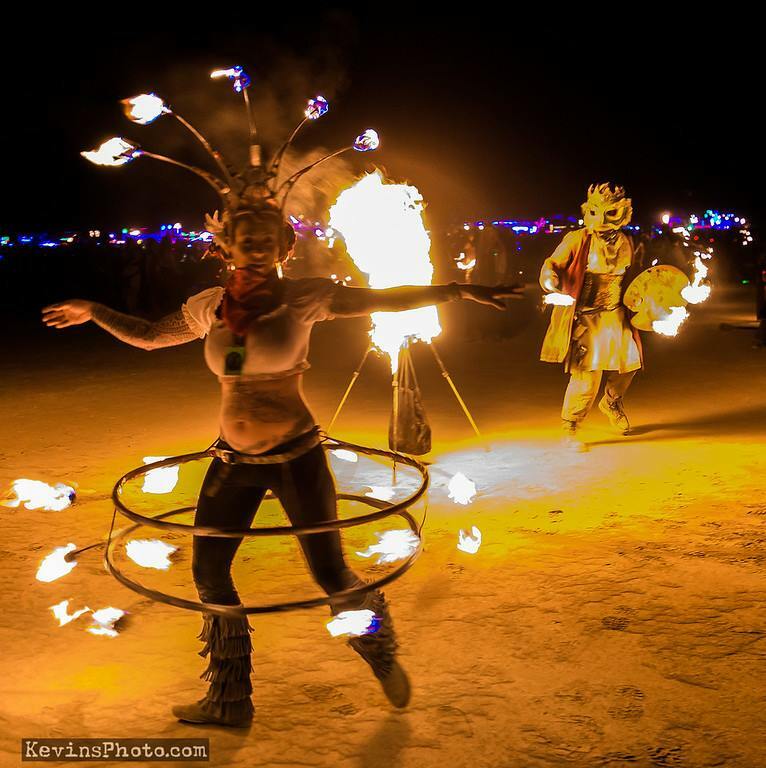 Thunderdome! Mudwrestling! Breakfast! Plus, the ongoing search for Sparkle Pony! Thanks again for reading, everybody, and stay tuned! There’s a lot more to come in 2016! 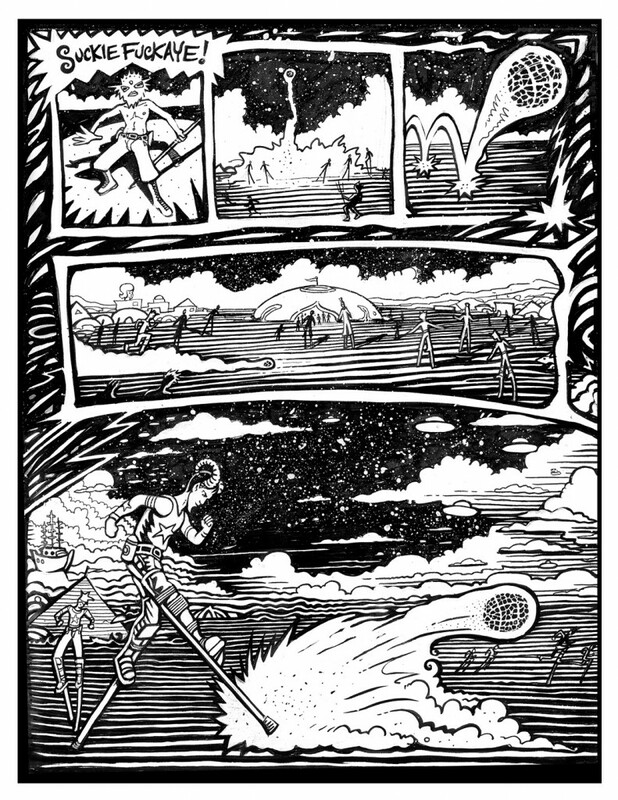 A page of stilt soccer from an older Drink Water comic, circa 2008. 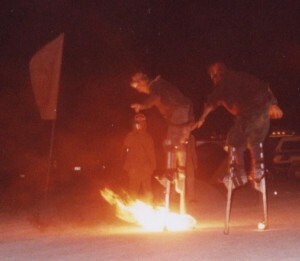 Flaming Stilt Soccer, Black Rock City 2000. 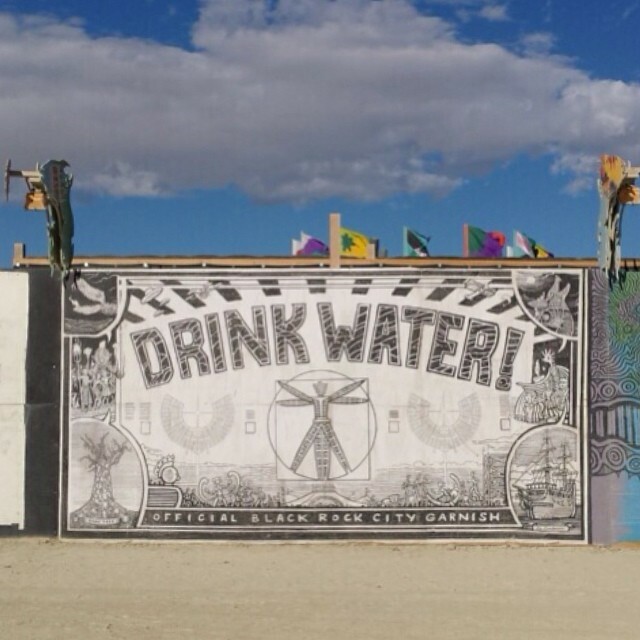 Drink Water will be going on a short hiatus. But fear not! New episodes will resume mid November, 2014. I have two painting exhibitions of new work opening next month here in Philadelphia, and there is a lot of work to be done. But stay tuned! As soon as the shows are hung, the episodes shall resume. November 2014! 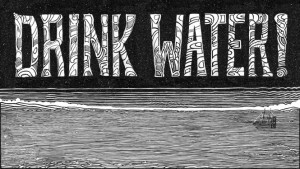 I’m planning a print collection of Drink Water at the end of Chapter 7, which means that We have 2 1/2 chapters remaining in Book #1. We are currently about 150 print pages into our story, out of about 230 total (estimate). So there’s a lot more to come. In the meantime, enjoy this picture from the archives. 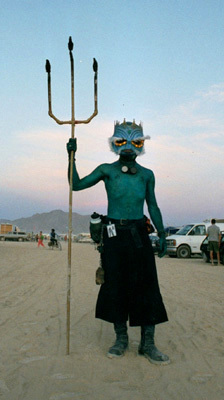 Neptune in Black Rock City, circa 2001. 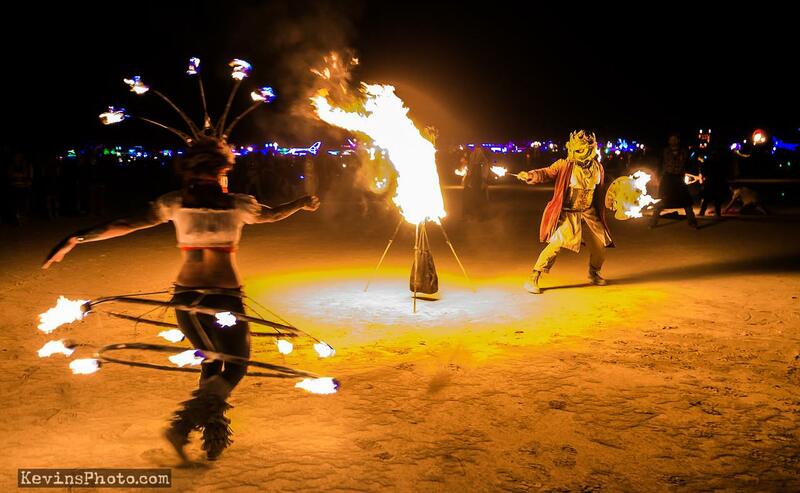 Photo courtesy of Christopher Rainone. Thanks for reading, everybody! Suckie fuckaye! 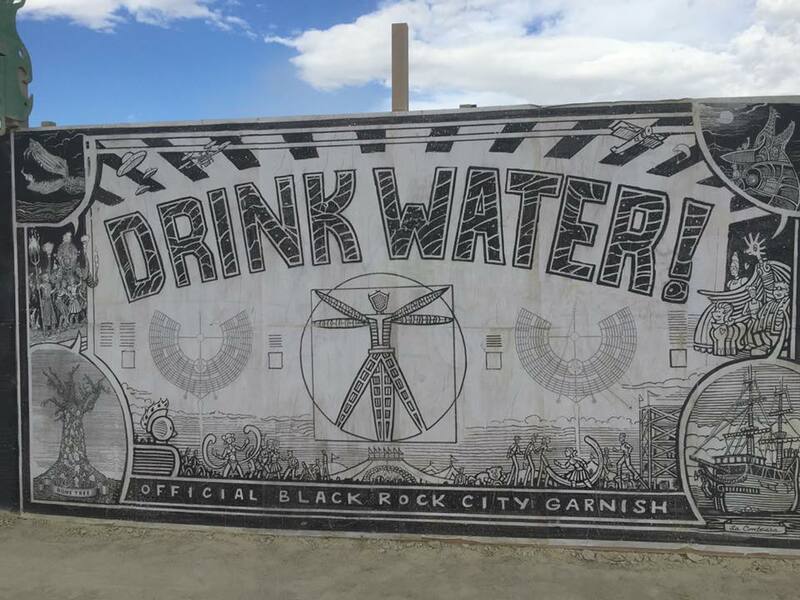 Drink Water! 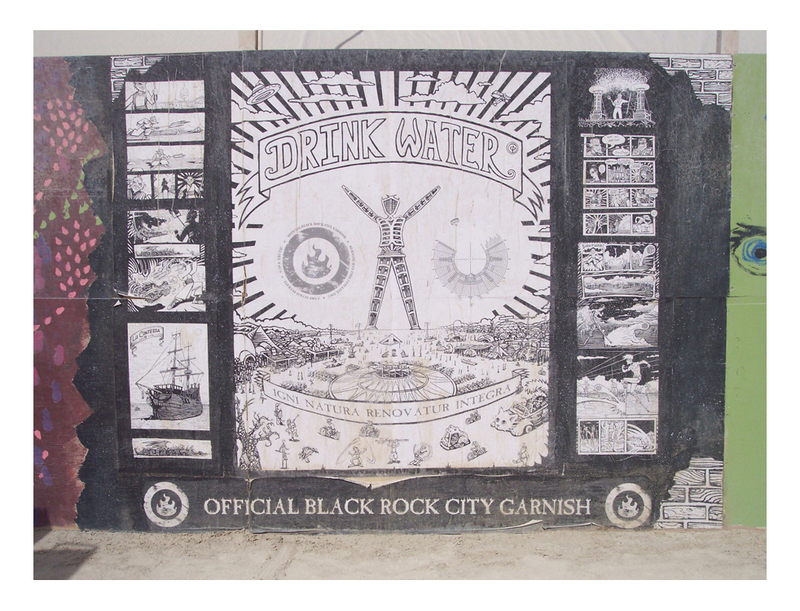 Center Camp Mural, Black Rock City 2007.